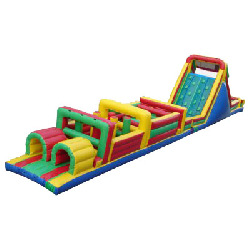 The Obstacle Course consists of 57 feet of inflated obstacles to dive through, weave around, crawl under, and climb over. It finishes with a fast slide to the finish line! It is always a favorite. Participants must be at least 48″ tall. Jump, crawl, and stumble your way through one of our most popular items.